Did you ever feel homesick when you first came to America? 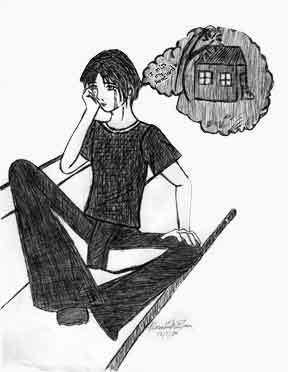 Many students agree that homesickness is one of the primary problems that ESOL students have to deal with. The students who feel homesick are not only those who just came to this country and don’t understand English very well. Many who just come to the country and who speak English feel homesick, too. Junior Esteban Garrido has been in the USA for only six weeks. “ I just got to this country and, even though I learned English in my country, it is really hard for me not to feel homesick,” he said. For Esteban the hardest thing about feeling homesick is the moment when he receives a phone call from his family or when he calls them. “There is the moment when I really feel lonely,” he said. Another reason why people feel homesick is because of the many changes they face.” I really miss the hot weather and the education system in Ecuador,” Esteban said. Not knowing English is another reason why people may feel homesick because the language is very difficult to learn. But students who have taken some English course before they came to America would probably find that things are a little easier for them. “I learned English in Ecuador. I took many English courses and those courses helped me to feel a little bit less homesick,” Esteban, said. Esteban added that a friend of his who did not know English came to the U.S.A. a week before him and his friend is always telling him how much he misses his family in his country. 12th grader Teo Ureña has had experiences similar to Esteban’s. He has been in the country for 2 years. “I remember my first day of school. It was so confusing. I don’t know how to explain it, but it is really hard leaving your family behind and then coming to a new country and to a new school,” Teo said. He was grateful for help he got from his ESOL teacher, Ms. Zompa. “She helped me a lot with my English,” he said. But even though he learned English, he didn’t stop feeling homesick. “It is hard not having anyone to talk to and not understanding the language,” Teo said. “I didn’t know how to speak English when I first came to Blair but I knew that if I worked hard, ESOL wasn’t a program where I was going to be for long.’ He also thought that if he got out of the ESOL program, he wouldn’t feel as homesick. Many students just like Teo have a very clear idea of what needs to be done to help people not to feel homesick. But in order to have the same expectation that Teo has, people have to understand that it will be hard because there are a lot of things that you will have to give up. “I knew it was going to be hard and I also knew that it was going to be even harder if I didn’t learn how to speak English,” Teo added. Some believe that being homesick is like a disease that if you don’t treat it, it may cause you to be miserable, and there is only one thing you need to do in order to treat it and that is to keep yourself busy. “Don’t just stay home and do nothing,” Teo said. “Go out have fun. Play sports and you’ll soon stop feeling as homesick as you once did.” Teo believes that we should not let not knowing English and the memories we have from our countries stop us from success.